Has it been awhile since you’ve pitched in to bring the office snacks? Bagels are the perfect snack for when you’re on the go or wanting to take a moment to wind down, especially when you can enjoy flavors and spreads that match your taste and personality. When you wonder, “Where will I get the best bang for my buck?” look no further than The Bagel Bakery. 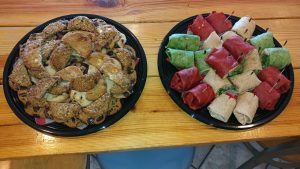 There are various catering and carry out options available for your next work meeting or event, depending on how many people you’re trying to provide for. For catering options, feel free to call us and let us know your needs so that we may fully accommodate them. On the other hand, if you are only needing to feed a few people, our Bag O’ Bagels deal may be perfect. You can pair a baker’s dozen of your favorite bagels and two 8 oz. tubs of cream cheese for $17.79! Your coworkers will think you spent a fortune when they try these high quality bagels – making you the new favorite at your workplace, without having to break the bank! Have you noticed that slight breeze outside? That’s what we as Floridians like to call fall. Although the leaves on trees don’t change color, nor does the temperature rarely drop below 75 degrees, there are still plenty of reasons why this is so many people’s favorite season. With fall comes school being back in session, football season, trick-or-treating, and a reason to eat anything pumpkin flavored. If you can’t love fall in Florida due to its unusual weather, it can still be appreciated for the opportunity to feast on delicious fall foods and flavors! If you’re excited for the upcoming holiday season to begin, kick start your fall morning breakfast with our flavorful pumpkin muffin. 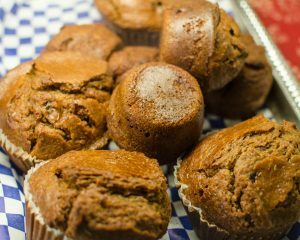 Our pumpkin muffin is baked in-house, along with all of our other delicious pastries, bagels and muffins. You could even pair it with a latte to experience the Bagel Bakery’s own take on this classic combination. Who knows – it could be your new go to breakfast all year round! 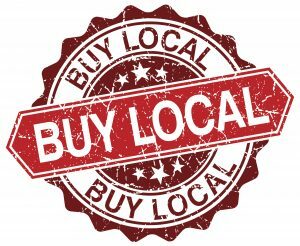 Did you know that choosing to eat at the Bagel Bakery, a locally owned store, generates almost four times as much economic benefit for our surrounding region? That’s not to mention the obvious benefits of enjoying a fresh bagel, a nutritious build-your-own salad or a one-of-a-kind cup of coffee. The Bagel Bakery is independent and contributes 100 percent of its income to the local economy. That’s good because a recent study found that for every $100 spent at a local business, $68 remained in the city whereas only $43 stayed in the city for every $100 spent at a chain location. 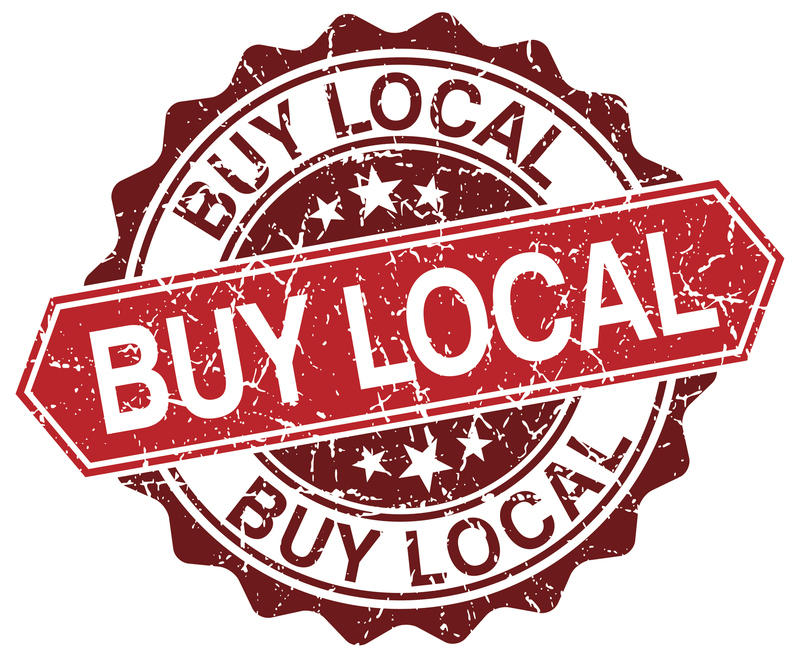 Not only does it allow for economic benefits, eating locally grows our community stronger, forms personalized service and helps you know the friendly faces behind the product. The Bagel Bakery has been fortunate enough to build relationships with numerous local customers and strives to serve our community in any way possible. Come in for a bagel and you’ll see for yourself just how good “local” can taste. When we think of food that needs to be boiled, we often first think of noodles, corn or vegetables. But, why would you boil a piece of bread? According to the expert bakers at The Bagel Bakery, if there’s no boil, there’s no real bagel. Boiling a bagel before baking it creates a delicious crunchiness on the outside and chewy toughness on the inside. 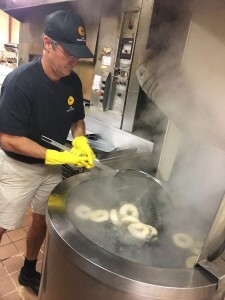 Bagels are typically boiled for 30 to 60 seconds, and the longer the boil, the thicker the outside of the bagel becomes. Additionally, lye, baking soda, or barley malt extract can be added when boiling bagels to give them a unique flavor. Our bakers work long, and sometimes odd hours boiling and baking in order to ensure the quality of their bagels are top notch. If you would like to see how the professionals create their masterful take on bagels, you’re welcome to meet us at the shop at 3 a.m.! But if you’re like most people and a 3 a.m. wake up call doesn’t sound exactly appealing, we’d love to see your smiling face grab a delicious bagel and cup of coffee before work, so stop by and see us!